The second edition of this widely acclaimed book takes as its main theme the question of how states and societies pursue freedom from threat in an environment in which competitive relations are inescapable across the political, economic, military, societal and environmental landscapes. Throughout, attention is placed on the interplay of threats and vulnerabilities, the policy consequences of overemphasising one or the other, and the existence of contradictions within and between ideas about security. 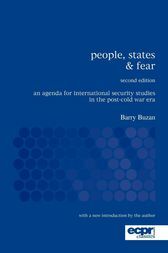 Barry Buzan argues that the concept of security is a versatile, penetrating and useful way to approach the study of international relations. Security provides an analytical framework which stands between the extremes of power and peace, incorporates most of their insights and adds more of its own. People, States and Fear is essential reading for all students and researchers of international politics and security studies. The ECPR Classics edition includes a new introduction from the author placing this classic text within a current context.